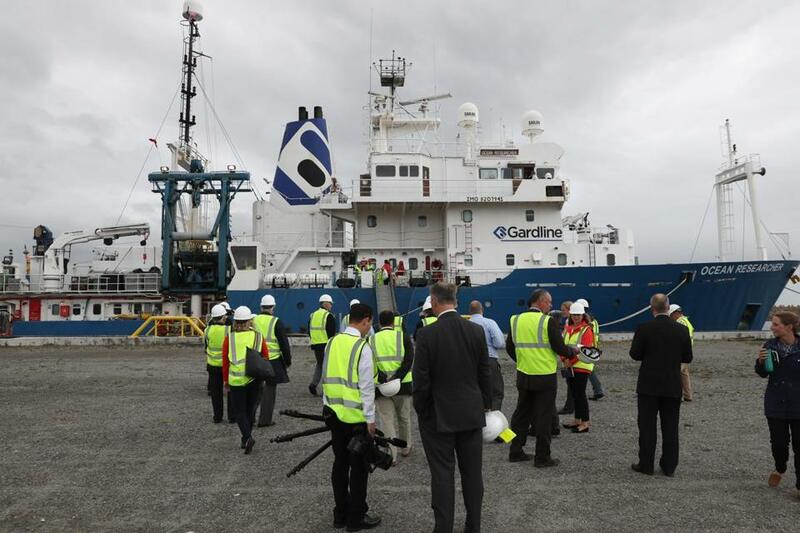 Officials and media went for a tour of a DONG wind research vessel at the New Bedford Marine Commerce Terminal. Three offshore wind developers signed an agreement on Tuesday to use the state’s $113 million New Bedford Marine Commerce Terminal, providing a key victory for the Baker administration after a state agency failed to generate much income from the port. Governor Charlie Baker joined representatives of the three companies — Deepwater Wind, OffshoreMW, and DONG Energy — in New Bedford to celebrate the deal. The agreement came about a month after Baker signed a new law that will push big electric utilities to buy as much as 1,600 megawatts of offshore wind power over the course of a decade. Supporters of the law hailed it as a way to kick-start a new industry in the state. The developers agreed to pay $5.7 million a year to the Massachusetts Clean Energy Center to use the 26-acre terminal as a staging ground for offshore construction. It’s likely that the developers would take turns at the port, based on when they win the bids for the utility contracts, although it’s possible some overlap would occur. The developers had been in talks for months to reach this agreement, realizing that each would need an onshore operations base. They waited to sign the deal until the Legislature passed the new energy law. All three have secured leasing rights to federal waters south of Massachusetts and Rhode Island. The quasipublic Clean Energy Center may need to wait a bit for that first lease payment, though. It could take at least three years for work on the first wind farm to start. And the wind farms still aren’t guaranteed to happen, at least not yet. The agreement signed on Tuesday is only a letter of intent. The companies also must secure financing for their projects at some point. The commerce terminal was commissioned by the Patrick administration, but the project wasn’t completed until soon after Baker took office last year. The agency suffered a setback around that time when developer Cape Wind Associates canceled its two-year lease for the terminal after struggling to find financing. The headaches continued as the Clean Energy Center tried to hire a port operator to run the terminal for general shipping but was unable to reach a deal, leaving it relatively unused. Wind turbine company Gamesa leased it for several months last year to help supply parts to a wind farm in Plymouth, a scrap metal company currently leases two acres for storage, and a solar firm is using a tiny piece of the property. Stephen Pike, the Clean Energy Center’s interim chief executive, said the agency remains focused on finding shorter-term tenants, to fill the gap until the wind developers need the site. He said the terminal generated about $250,000 in revenue during its first fiscal year, which ended in June. Meanwhile, Pike estimates it will cost the agency about $500,000 a year to run the port in the near future, although that figure includes a full-time manager to be hired this fall. “A year and a half ago, when the Cape Wind project ran into significant difficulties, I will say that we were quite concerned with the future of the facility,” Pike said. The developers still need to finalize the details of their wind farm projects, including the size and precise location of each turbine. Thomas Brostrom, general manager of DONG’s North American operations, said his company has dispatched a research vessel to the area to collect data about the seabed and help craft more detailed plans. Brostrom also said he expects as many as 1,000 construction workers to be on the job if DONG wins one of the contracts. Plenty of questions remain, though. The Clean Energy Center is facing a lawsuit filed by contractors that built the terminal, accusing the agency of misrepresenting the scope of the work. That lawsuit, if successful, could drive up the project’s costs. The contractors say they’re owed at least $23 million. The agency also needs to work out how the wind developers would share the property if construction schedules overlap. “If you build multiple wind farms at the same time, then you’ll have some capacity constraints,” Brostrom said.